Stylish apartment close to the JR train station. The apartment consists of one bedroom and living room with a kitchen. The bedroom has a double bed and double-glazed windows to let in sunlight. In the living room there is a semi-double-sized sofa bed and a sliding door to the bedroom. The fully equipped kitchen comes with a refrigerator, toaster oven, microwave, gas stove, cooking utensils, dishes, glasses and cutlery. The bathroom has a shower and a bathtub. There is a separated toilet. Free high-speed Wi-Fi is available in this apartment. Nice clean apartment very close to train and grocery. Very convenient. Everything was clean and convenient. Everything is exellent. The thing I like most is the location, one minute walk to supermarket but still very quiet. The apartment is in a great location very close to the train (JRline) which you walk through a 24 hour supermarket to get to. Lots of little shops in nearby area however just one stop over in ogikubo is some larger shops and well price restaurants and one stop the other way is a beautiful park and the anime museum. Makato the host is very friendly in person and tells you a lot about the surrounding area for you. Please make sure you give him all your arrival details including the time you will arrive at the closet train station as the apartments are mostly permanent residents and there is no on site manager. Wonderful apartment and beautiful location. Would definitely stay here again and recommend it to everyone. My girlfriend and I stayed at a Nishi-Ogikubo property for a little over two weeks and I couldn't be any happier with the location or the care involved in seeing us up. The location was PERFECT - 25 minutes away from Shinjuku, and mere minutes from the stops for famous sites like Nakano Broadway, Kichijou's eight story malls, the Ghibli Musem and notably - "Temari no Uchi," Tokyo's most whimsical cat cafe. Within 50 feet of the Nishi-Ogikubo stop is a gargantuan, 24 hour grocery store and two 7/11s for ATM's. From mouthwatering bakeries, bustling late night izakayas (meat and beer restaurants) to novelty pineapple ramen, that stop has an incredible range of food to grab at all hours of the day -- or if on a slightly more modest budget, the food (including partially and fully precooked) at the supermarket is minutes away. Our rep was Makoto, who went well beyond any expectation of service we could have dreamed of. Communication by email ahead of time was a little formal for clarity's sake, but in person he's a super funny guy who gave an amazingly comprehensive orientation. He brought with him pamphlets of dozens of wonderful things to see and do in Tokyo. We had set up a fairly long list of things we had planned to do ahead of time, and he was patient enough to give us some quick tips and opinions for each one. His trade is tourism and you can tell that he takes great pride and genuine enjoyment in making sure guests have the trip of a lifetime when visiting Japan. As an example of the extra service he goes out of his way for, he was kind enough to set up luggage delivery to the airport with us, and left a completed form in our mail slot so we could just take it all to 7-11 for pickup. A small tip - the office respond very quickly to emails during office hours, but if there's something that requires an immediate response, you can actually pick up a green payphone at a train station, and call your rep directly while speaking in English. Even though it was evening hours, Makoto speaks clear, perfect English, and helped us out the first night we were there. We went as part of a large of 14 or so spread out across several Live In Asia apartments, and we all had a great time. The next time I'm in Japan I will definitely use LIA and that same area. The apartment was VERY quiet, clean, modern and comfy. Japan is an amazing country, and coming home to a good meal and comfortable bed did wonders for letting us fully appreciate it. My wife and I stayed here for five days on our way to Europe. Wasn't sure what to expect having never been to Japan or used VRBO. We really enjoyed staying here. Our host was most helpful, among other things telling us how to use the public transport. We quickly got used to the train system which we used a lot. 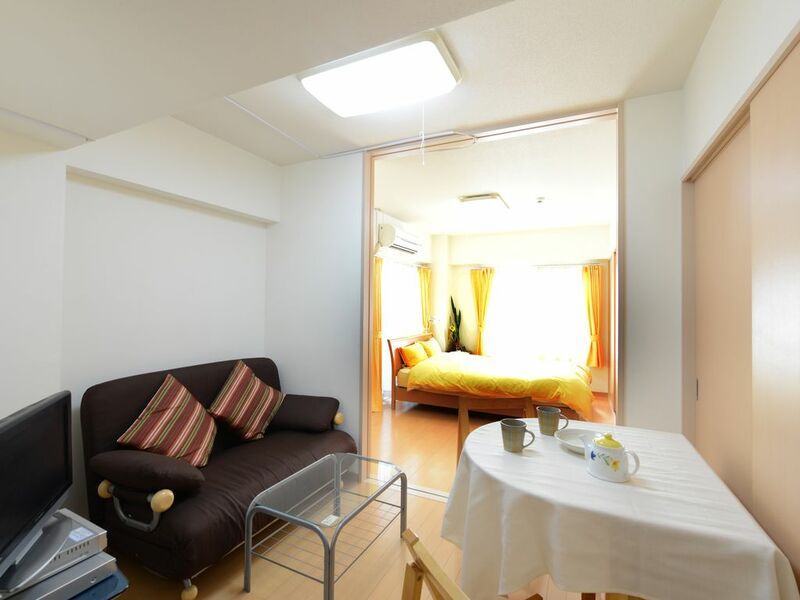 The apartment is VERY close to Nishi OgiKubo station and also VERY close to a 24 7 supermarket.